The Sun newspaper also jumped on this despicable bandwagon by printing: “Crazed rookie pilot murdered 149: MADMAN IN COCKPIT”. As the media play a huge part in shaping public opinion, they have a responsibility to remain impartial and fair but sadly their portrayal of mental illness in this way isn’t going to humanise those with conditions like depression but will in fact stigmatise them further. Mental illnesses aren’t monstrous, contagious diseases that make people ‘go crazy’. They are complex, psychological conditions that affect around 1 in 4 of us. So why do we allow our perceptions to be shaped by the media into this cookie cutter mould of fear and ignorance? 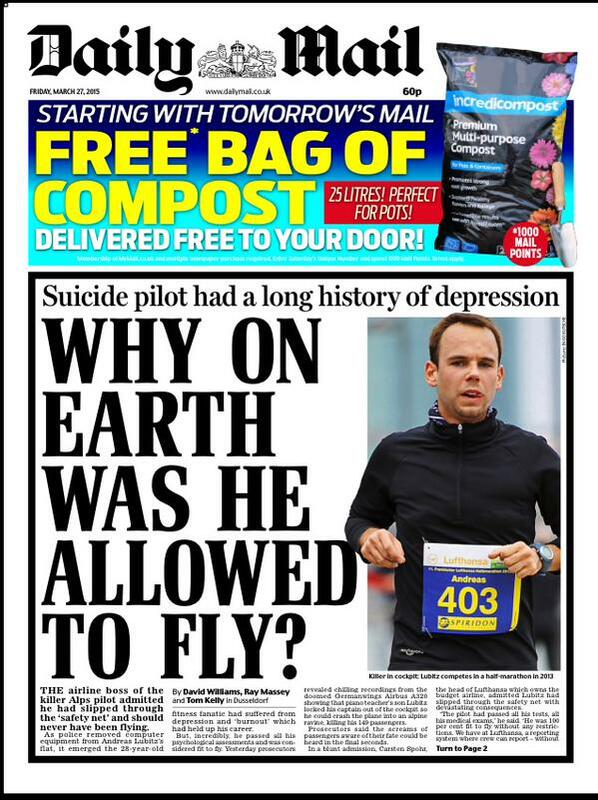 Of course, there should be investigations into Lubitz to determine if this tragic event could have been prevented, but by calling him a ‘madman’, the media are demonising depression itself and implying that everyone suffering from the condition is erratic and dangerous. As for the Daily Mail’s tasteless comments, I wonder if they would also pose similar questions like: “Why let people with depression have jobs in positions of trust at all? Why not lock them all up?” Ridiculous as these may sound, they are sadly not far from the kinds of headlines we see in relation to mental health. By scaremongering in this way, the media are discouraging sufferers from coming forward and seeking help and they are undermining the decades of hard work made by organisations like The Scottish Association for Mental Health (SAMH) and similar groups who have made steps to end the stigma surrounding mental illness. Not only are these inferences – that depression and other mental health issues are directly linked to violent crime – insulting but they are also completely false. Forensic psychiatrist Dr Seena Fazel conducted research into the link between crime and mental health in 2006 and his findings proved that this stigma portrayed in the media is completely unfair and unjustified. Dr Fazel said: “In many ways the most interesting aspect of our findings is that 19 out of 20 people committing violent crimes do so without having any severe mental health problems”. In support of this evidence, a spokesman for the Sainsbury Centre for Mental Health said: “Having a severe mental health problem does not make a person violent. People with conditions like schizophrenia are in fact more likely to be the victims of violence than others in the population”. The sad thing about this story is that this is not the first time our media has portrayed those with mental health problems in a negative light. The suicide of beloved comedian and actor Robin Williams in August last year was met with appalling and scandalous headlines which disregarded his family, charity work and successful career and instead sensationalised his battles with depression, alcohol and substance abuse. 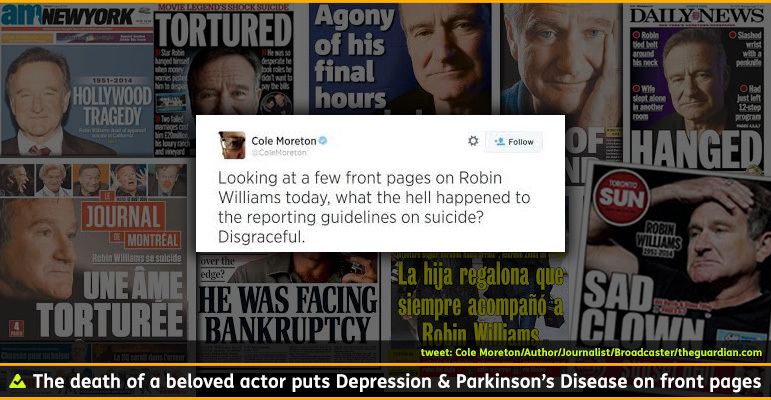 The Toronto Sun took arguably the lowest stance on William’s death by printing the headline “SAD CLOWN” accompanied with an unflattering photograph of the late actor. These comments made by newspapers and media outlets are not just controversial or risqué but are vile and inexcusable. With an estimated 450 million people worldwide expected to have a mental health problem, we cannot afford to sit idly by and allow our media to disgrace mental illness in this way. It is our duty to spread the word about the facts and real life experiences of those with mental illness in order to deconstruct this medieval stigma.